When talking about the possibility of having a third baby, my husband and I joke that the switch from man-on-man defense to zone is a game changer. With him deployed, I’m finding more and more that the one parent to two toddler ratio is a constant fast break. This week has been no exception. While helping my 3-year-old get a drink, my 2-year-old got into my makeup bag. When I heard that guilty voice yell from another room: “Mommy! Look at me!” I knew he had found trouble. 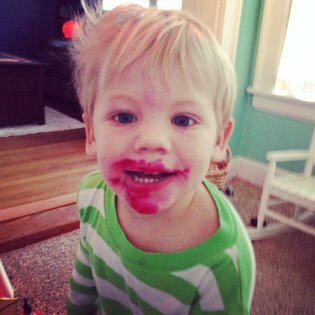 Luckily, it was just a tube of lipstick. I got him (and our walls) cleaned up just in time to find my daughter “helping” clean by spraying liquid Clorox on my bag of groceries. Is bleach GMO free? While daily life can be challenging now that I’m outnumbered, the most daunting task has to be traveling. Armed with sticker books, colors, snacks, movies, more snacks and absolutely every trick in the book, it all boils down to this one, unequivocal fact: You have no idea how it is going to play out. Flying with toddlers reminds me of riding in a cab in college with drunk sorority sisters. Maybe they will sleep. Maybe they’ll cry. Maybe they’ll vomit. Maybe we will just laugh the whole way and create great memories. Both scenarios demand a sense of humor and a healthy dose of cautious optimism. The last time I traveled for Thanksgiving with both children when my husband was deployed, I was graced with three out of four incredibly easy legs. The second flight, however, will remain etched in memory as the worst of all time. Our first flight was delayed. Wearing my then 6-month-old in a carrier and pushing my almost 2-year-old in a stroller, we barely made it to our plane before the cabin door closed. I carried both children half-way down the aisle, sweating, bumping elbows, offering apologies and promising everyone around us drinks, only to find someone sitting in one of our two seats. I politely informed the woman in 16D that I believed she was in the wrong row. She, visibly annoyed, waved her boarding pass in my daughter’s face saying, “Tell mommy I’m in 15D and I’m not moving.” Knowing that my daughter was watching this interaction, I tried to de-escalate. In my calmest voice, I said: “Ma’am, you are sitting in 16D. Would you mind moving?” She refused.